Just in time for the big-screen release of the Warner Bros. film Aquaman! As these stories begin, Aquaman has renounced the throne of Atlantis—until from a forgotten corner of the ocean emerges the threat of the Trench! 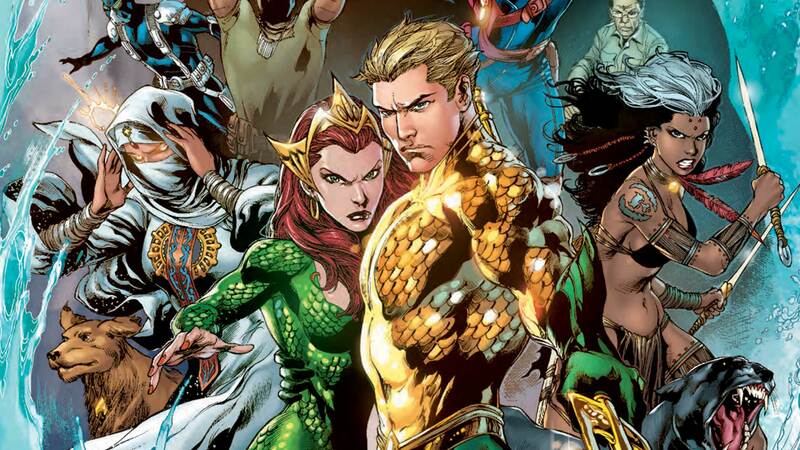 Then, Aquaman joins up with his old teammates, the Others, to learn who destroyed Atlantis! But as they seek the truth, Black Manta is stalking them all—and Mera learns some dark truths about Aquaman! And in the “Throne of Atlantis” epic, Aquaman teams up with his Justice League comrades to defend the surface world from the invading Atlantean horde. Collecting the entire run of AQUAMAN written by Geoff Johns, this 728-page hardcover includes AQUAMAN #0-19, #21-25, #23.1 (featuring Black Manta), #23.2 (featuring Ocean Master) and JUSTICE LEAGUE #15-17.